This compact and stylish shower filter is perfect for those of us who want to keep our existing shower heads but still want the benefit of healthier, cleaner, chemical free and softer showers. This compact and stylish shower filter is the perfect shower filter for those of us who want to keep our existing shower heads but still want the benefit of healthier, cleaner, chemical free and softer showers. 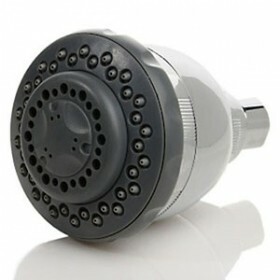 With its wonderful chrome design and superior quality filter cartridges produced exclusively for PureShowers.co.uk, you will never regret installing this shower filter in your bathroom. 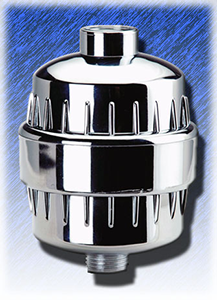 It simply attaches to the base of your steel shower hose or attaches between your existing shower head and the water pipe, thus filtering all the impurities and nasties from shower water before it reaches us. I have not yet fitted this to the shower. I have bought for a family member who lives in an area with harsh water which affects her skin. I previousely purchased one for myself whilst living in Asia. It was very effective. Can definitely tell the difference between the water now, my skin and hair feel softer and the water doesn't smell likes chemicals anymore. Very happy with my purchase. Will buy again. Easy to fit in restricted space. 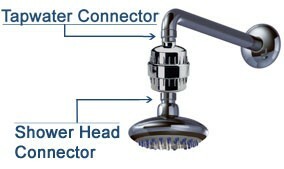 Did not fit correct end of Mira shower head of bar end thread bigger than shower filter. Fitted on thread top end of shower but leaks advised to use plummers tape to secure leak ** Reply from PS ** As per emails, unfortunately your shower was not standard. But glad you were able to fit filter on other end. I really did notice an immediate difference - Product buildup, itchy skin, all has disappeared. Perfect for people renting a property in a hard water area! my scalp and skin feel cleaner ? I am very pleased with the filter. good a changing the quality of the water. Noticed a difference in the water quality straight away. A much better shower experience. Had to purchase additional washers to insert in female end of filter to stop it leaking everywhere. Should come with these! ** Reply from PS ** The filter comes with 2 washers, usually that's enough, but not all shower fittings are the same. Excellent. Immediate end to sore eyes and itchy skin. I really mean it works a treat. I had suspected tap water was the problem and is clearly verified. good product, good customer service when I emailed to request some information - quick response. I had to take pot luck on this product to see if it would fit my new shower as your staff couldn't tell me. ** Reply from PS Team ** The phone staff did let you know that our products fit 1/2" British Standard Pipe size threads. Also they did say that you could send us a picture and we'd give more advice. Thanks for the review. Speedy delivery, simple to install, appears to be making a real difference to the softness of the water. Works well. Got help from the team as to how to fit it on. Really appreciated their help. Should clearly state the electric shower models it fits. A triton is a pretty standard shower and it doesn't fit on ours. Postage to return it and extra £1 plus postage for the slimline model. Would not order from you again. 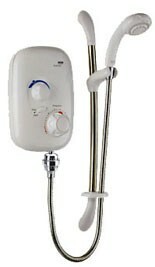 ** Reply From PS ** Sorry to hear the original unit didn't fit your shower Jenny. There are many hundreds of electric shower models, so we can't list them all. But all of our shower filters should fit standard fittings (1/2 inch BSP). 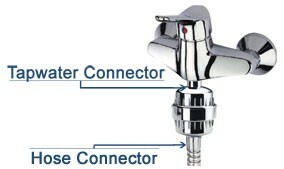 Also we're happy that we've been able to work with you to find a suitable shower filter to fit your Triton shower. Very pleased with this product, skin less itchy after showering. Good value for money. It's really great. My skin doesn't fall of when I get out the shower!! Having recently moved into a hard water area from a soft water area I've really struggled with the adjustment. This is exactly what I needed. Thank you! Having newly had eczema on my face for the last 8 months or so, and not wanting to continue using steroid cream especially around my eyes, I started using this water filter. I have to admit I was somewhat sceptical that something so easy to install and relatively cheap would work. I am converted! I haven't had a break out since using it and not only that - all my skin feels softer and doesn't dry out at all. Frankly a miracle, which has been so easy to use I'm annoyed I didn't get one earlier. Not only is the filter fantastic, but also I have contacted Pureshowers with a query and got a really speedy response which was friendly and very helpful. Can't recommend both the company and this product highly enough. Made a big difference in the skin. Barely see watermarks now. But, unfortunately didn't fit our shower and leaks in the joint. But worth anyway... *** Reply from PS Team *** Great to know you're enjoying your shower filter! Sometimes leaks at the joints can happen because not every shower is 100% the same size. Please wrap a little bit of teflon / plumbers tape around the leaking joint and that should fix it. 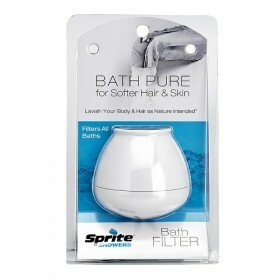 Purchased 2 inline filters for showers as water in London is so harsh causing skin irritation. Great product and great service, delivery fast and efficient. No more eczema and getting comments on how nice my hair is looking. Bit of a problem with the initial order, however delighted with the product - no more itchy legs. As I have a real problem with chlorine in the tap water I need a regular supply of filters for my shower. I have had difficulty getting these until I found your website. I found the filter easy to replace and would like to order a refill. I always filter water where I can and am very happy with my shower filter. I would also like to filter bath water and will be looking to do this quite soon. The filter itself seems to work really well and I do think it has made some difference. Unfortunately it does not fit between the shower hose and the tap because the barrel is too wide, so we've put it between the hose and the shower head. This seems to still be effective, although a bit of an arm workout when showering! ** Reply from PS Team ** Did you see that we can offer you the free Angle Pipe to fit in tricky situations? Did we mention, it's Free? :) We'll get in contact. your web site is not as user friendly as it could be such as your filters and their need for an angle joint there should be a window that tells you and allows you to order also when contacting by phone it was not explained to me that your response to my question would be by email not telephone ** Reply From PS ** : Thank you for your review. The product page of the product lets customers know that if a Free angle pipe is needed, you just need to put it in the shipping notes during checkout. Apologies if you didn't see it. We will speak to our phone staff, apologies if they did not give you the correct information. Thanks again for your order. Excellent products , easy to use web site . fantastic service team . One more rubber filler-washer for the connection would have made the filter fit perfect. As it is, it leaks a little at the connection. Please include one more in the future! Always felt very tender with the skin dry and sore. I`m really happy with this filter. Soap does go further and showering feels - less harsh, I guess! This is a must for anyone living in London where the water is unbelievably hard and heavily treated. Very easy to use, first screw the filter was very heavy. Unfortunately, it lacks a suitable sealing ring, because the thread is overall too short! Would be nice, but if you could just settle with these for the price. Does not cost hardly anything, but saves the (quite wide) path to the hardware store just because of such a small part. There was a leak between connections. However, it was resolved by placing four washers in the part attached to the tap. Voila! Thank you for the quick response of sending me the faucet so as I could fit the filter to my shower. Over time I think it will help me as we have very hard water and smells of chemicals. It had been a few years now that I had suffered from a form of pruritus in my back because of the hardness of the water in my area. Because I didn`t own the place I lived in, I was not allowed to install a water softener. So that got me looking for another solution and that`s how I came across your shower filter. Since then I have noticed a great improvement on my skin. This shower filter is very effective. Very effective product for my 3-month old baby suffering from a very sensitive. The water in the Ile-De-France region is not so bad but there`s usually quite a fair amount of lime residue left in it. This filter removes everything and makes our skin softer. I totally recommend it. Great service, and very happy with the filter- I have really noticed a difference! have used shower filter for 2 weeks, soap foams up better, but itching after shower still persists, am now thinking sls in the shower soap is the problem, so will have to look into that, filter seems to work fine. Positive: very quick delivery, the filter arrived in just two working days and it was very easy to install. Negative: When I bought the filter I was not sure if I needed a water softener or having just a filter would help. Unfortunately I am still itching like crazy after each shower. This does not mean it will not work for you, I live in London where the water is “very” hard. Filtration seems ok in that there is no hint of chlorine any more, however the filter is quite bulky and heavy, which require the shower head to be additionally supported. Can live with that though. All in all happy with purchase. __ Reply from PureShowers.co.uk Team __ : Hi Catherine! Thank you so much for your feedback, we really do appreciate it A LOT! :) Sorry to hear you`re having a little leak problem with your shower filter. This can sometimes happen if the shower filter is not installed properly. Please drop us a line at info@pureshowers.com and let us know where exactly the leak is, we can then help you stop that pesky leak! Thanks again. Easy to install. Seems to be working fine. I am extremely happy with both your service and quality of products. I shall certainly be recommending your products to friends and family. The filter arrived very fast and as described - it even came with the complimentary angled pipe even though I requested it a day after I placed the order. I am a young woman, with no plumbing experience whatsoever, but the installation of the filter was very simple and quick. I could see the difference in my hair after the first couple of washes and I am very happy with the product and the overall service. I have already recommended pureshowers.co.uk to a few friends. I ordered a shower filter - it arrived in very quick time and was as described. Good service. Excellent service . I did had problems contacting you by phone ?? The filter works well and we have noticed a difference already. 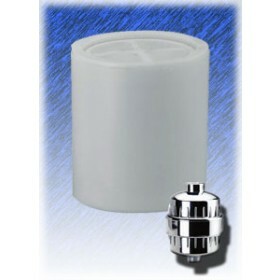 We are very pleased with our purchase of the Compact Shower Filter, no more itching after taking a shower. Happy days! Fast execution of my order (I was able to change my order to a slim line shower filter with just a single call). 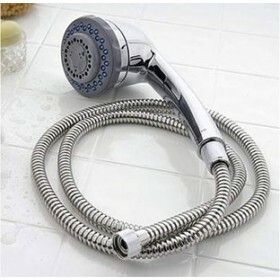 Product quality is very good, the limescale in our shower (Berlin water) is greatly reduced. Cleaning the shower enclosures (tiles and glass) is now a lot easier. I am completely satisfied with the product. Everything is ok I have received the right product at the right place and only a few days after my order. Again thank you. I recently bought one of your products and I am extremely happy with my purchase! Thanks! After fitting the filter to the shower it leaked at the join with the main water feed but perhaps another washer will solve the problem. The filtered water is truly softer. However the PARAGON hand-held shower filter is a bit heavy for my setup although it works perfectly well. I recive my compact shower filter 4 weeks ago..but I had to use to for 1mth to make sure this was the one for me. I must say IM Very please..my hair feels so much softer has for my skin it feel soft /moisturise. THANK YOU Im very happy. Thank you - everything is good. Then handling is very easy, just as described. I can confirm that. The filter is grat and my hair has improved drastically :-) I need less shampoo and my hair tends to break less and is easier to comb. if i had known perhaps the filter had needed a connection I would have asked for one, as I didn't see anything about it. I`ve used the shower three or four times and I am so pleased about my beautiful and soft skin all over my body. Even my feet are happy and they have been dry before. It`s not necessary to apply so much skin cream any more. I can only recommend the product. A very quick handling of our order, therefore we received the filter very quickly. The water is now much more gentle to the skin, we were able to feel it immediately. I can`t yet comment on the durability of the cartridge. Easy to install, after some weeks of use the filter seems to help to reduxe dry itchie skin issues. I haven't really noticed a difference in my skin which I was hoping so am now on prescription medicine as a last resort for my allergies. Its a shame, maybe longer term use may result in differences in my skin and hair but none after using the filter for two months. Wish I'd thought of getting a shower filter years ago - skin far less itchy, no longer getting limescale-related dandruff and hair is much softer. I'll never use anything else! Wish I'd discovered this years ago - hair less brittle, skin less itchy and don't have limescale marks all over my bathroom. Love it! The shower attachment does a good job. What's missing is information about replacement cartridges. Quick and easy transaction. Will come back for renewals. Thanks and regards. It would be good to have information with the filter unit about the availability of replacement cartridges. Delivered on time and easy to install. Great website, easy to use and delivery was next day. Well chuffed as I didn't pay extra. Great product too. Thanks so much. Purchased the compact shower water filter and am very happy with the quality of product and water output. It is particularly very good for washing afro hair. Am very happy with this company and will continue to purchase from here. Excellent service , great product. The filter arrived very quickly after the order. It was extremely easy to fit and can definately feel a difference in the quality of the water. I live in an area that has a lot of limescale and can honestly say there has been a marked difference in the reduction of scale on the glass shower door. Well worth the investment. I am glad to feedback as very good. I am very happy with my purchase of the shower filter from your company. I am visiting my husband in Malaysia and noticed on my last visit how heavily chlorinated the water in the shower was and how it aggravated my psoriasis. My husband fitted the filter and it really was as easy as you reflect on your website. I did already purchase a spare filter as I will be here for around 6 months. My skin really does feel softer. There were some expensive options available here but as we only rent the apartment we live in we did not feel the expense would be justified. We live in Kuala Lumpur which actually means muddy water. Frequently the water is muddy except in the shower so I anticipate that the filter is working extra hard and I may need to replace it sooner than advertised. Hi. Good telephone support and speedy delivery. Goods as described and very happy overall. Thanks. The shower filter arrived on time; it was well-packaged and blessed with good looks! Unfortunately it leaked slightly, so my husband had to adjust something inside it to stop it from leaking. It's worked fine since then! 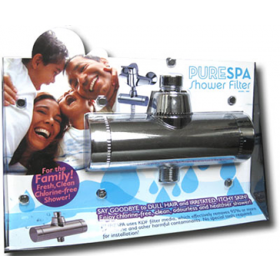 Ever since moving to Berkshire I have suffered with irritated skin and outbreaks due to over-chlorination alternating with dirty undrinkable water – until pure shower´s filer. Feeling soo much better now (fingers crossed the filters can withstand the full year). Great product, I'd give it 5 stars. Easy to fit and has certainly helped someone who suffers from itchy skin. Will certainly be ordering refills. Do you do a version that would fit a shower in a campervan?